I have cellulite. There I said it. It's nothing to be ashamed of and I have had it almost my entire life. Even when I was a figure skater in my teens, skating 8+ hours a day, I still had cellulite. It's not something I obsess over to be honest because that would be pointless, but I am a beauty product fanatic and have been wanting to try both of these products from Clarins for quite some time. I know there are other more permanent treatments out there for cellulite such as wrap treatments, lasers or heat technology (I've been reading about this one lately), but I am not sure I want to take it to that level right now. But never say never, I do love a good beauty treatment. But back to the less permanent options, I was curious after Clarins sent these products over to see if I would truly notice any difference. Who am I to turn down an opportunity for a firmer (looking) backside?? 1. 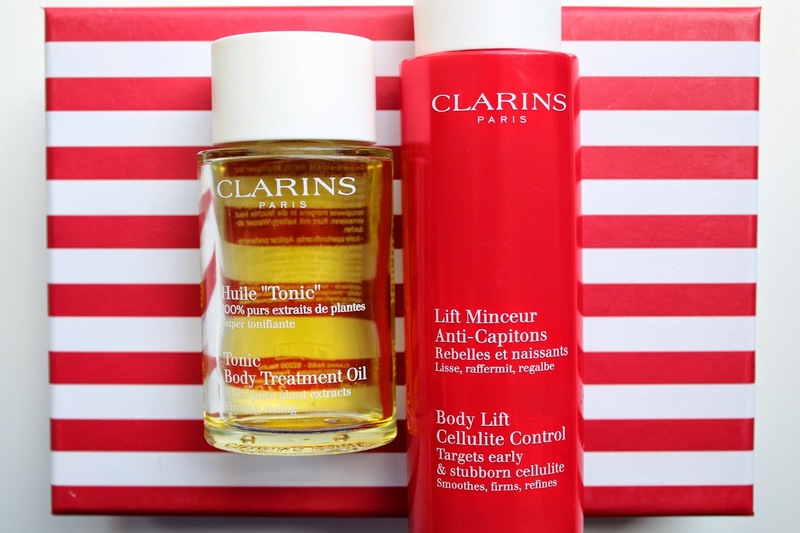 Clarins Tonic Body Treatment Oil - This oil is ideally designed to help skin firmness and prevent stretch marks, i.e. during pregnancy. As I am not with child, the second feature was not necessarily designed for my needs, but the skin firming aspect was the initial appeal. I should first mention how to use the oil because it can be a bit confusing. I typically apply to my thighs, legs and stomach in the shower after exfoliating and/or cleansing, rub into the skin and then rinse it off with a cold shower. The very first thing I noticed after using the oil was the immediate decrease in bloating and swelling that my legs suffer from in the summer. In addition to helping with water retention, it is incredibly hydrating and nourishing to my skin. I did see a slight difference in firmness after using a few days, but that was nothing compared to when I combined it with the Body Lift Cellulite Control. That is when I really saw a difference. What are some of your favorite body firming products? Tell me in the comments below! I just ran out of Body Lift tonight :( I'll need to have a look at the treatment oil too - it certainly sounds like a great combo! So good right?? I was hesitant as to if I would really see results and it was such a pleasant surprise to see such great results. Wow! How did you get to skate 8+ hours a day (which is awesome)? Homeschooling, or before/after school ice time? I ask as someone who also figure skated growing up (freestyle first, and later ice dance, my preferred discipline!)... but only ever got to a few hours a week, not a few hours a day! :) Also, and more to the point of this blog, might you have a recommendation for mascara that's budget friendly and waterproof, and generally doesn't clump, make lashes stick together, or make lashes get too dry... and preferably comes in a brown/black shade? (I tried a Clarins mascara - hence this note on a Clarins post - that I liked for separation & definition of lashes once, but not a lot of these other "criteria." Have also tried a few others - I'll admit that I'm generally partial to L'Oreal products! - but am still searching!) I know that combining all of those aspects together probably means that I'm asking about a product that doesn't exist, but I thought that if anything close to it does, this might be the place to learn about it! :) Thanks for keeping such a lovely, reader-friendly blog! Hi! Thanks for commenting! How nice to hear from a fellow figure skater! Were you an ISIA or USFSA competitor? I was ISIA - got through to Freestyle 7 before calling it quits. :) And I typically skated that much during the summer and then during the school year, I would skate after school for a few hours every day.